Hello friends!! Tuesday is here (and Halloween is just two days away!) and that means time for a brand new cue word!! Loved seeing how everyone interpreted last week's cue word, country. So many beautiful entries. 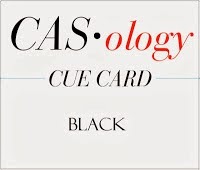 This week's cue word is "black" which could be tricky or not... lol!! 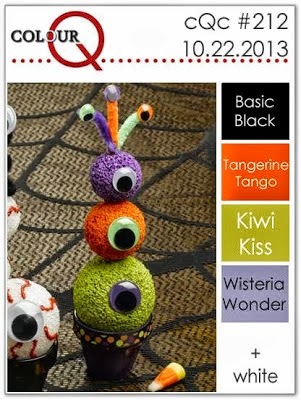 Joining us in the guest designer spot is the super talented, Kristie!! All the details can be found here. Since Halloween is just a few days away I decided to make one last Halloween card using stamps from Reverse Confetti. I cut a panel of black cardstock and then stamped the little bat image on the top half using VersaMark watermark ink. Embossing powder was applied and heat set. I die cut the banner using MFT's Jumbo Fishtail Flag Stax Die-namics and then stamped the banner with the fence and sentiment in black. The cat was stamped in black, trimmed out and Black Diamond Stickles were added. I adhered the cat to the banner using pop dots so it would stand out a bit more. Hello friends!! Hope you are having a wonderful day. The persistent fog that we have been experiencing here in my little corner of the world seems to have finally lifted, thankfully! It was getting a bit creepy!! Anywhoo... as my title indicates I have a couple of cards to share. Normally I don't post multiple cards for multiple challenges, but since both cards use My Favorite Things stamps and dies I decided to post them together. 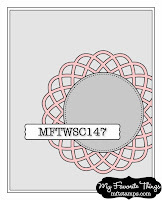 The first card is for the current MFT Wednesday Stamp Club sketch challenge. A nice, simple layout that you can take in many directions. I decided to pull out my MFT Snowflake Doily Die-namics die and cut one from some gold glitter paper from Stampin Up! (SU! calls it "champagne", but to me it is definitely not champagne it is gold!). I embossed the cardstock background with my swiss dot folder and then added the sentiment (from MFT's Seasonal Sentiments set) that I stamped on cream cardstock using burgundy ink and then die cut with a MFT Fishtail Flag Stax die. It is super easy to fishtail both ends of your banner with these dies since they have a see through plastic back to them which allows you to position the banner in just the right spot so the sentiment is center properly. 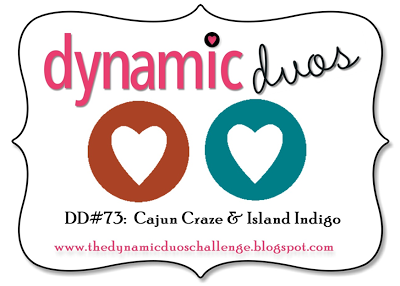 The second card uses the current layout from CAS(E) this Sketch and the current Dynamic Duos color combo. I think my idea for this card was a good one I'm just not sure that I executed it very well. 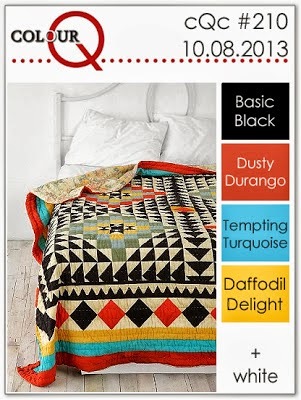 I combined two different MFT sets, Homespun Hearts and Abstract Art (hey... that rhymes, lol!) 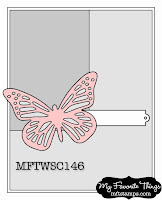 with several MFT dies, Hi Rise Alpha lower case, MFT/LLD Lead the Way and MFT/LJD Rustic Hearts. I think in retrospect I would have cut the arrow portion a little shorter so that it didn't extend to the edge of the card. I also think I should have added in some other neutral colors besides white. The whole card just seems a bit too stark (okay... so I can hear my friend Sue laughing right now! Yes, Sue... I do love my white space, but even I know when things are just a bit too stark, lol!!) But that is card making for you... a live and learn process!! Hello friends!! Hope have had a wonderful week so far. 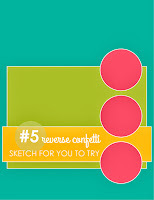 Have a little card that I put together for a couple of challenges: ColourQ and Retro Sketches. I think I may have said this before, but I'm not really big on Halloween and as a result generally don't buy many Halloween stamp sets, but when I saw the recently released Halloween sets from Reverse Confetti I knew I had to get them. The images are just so darn cute!! 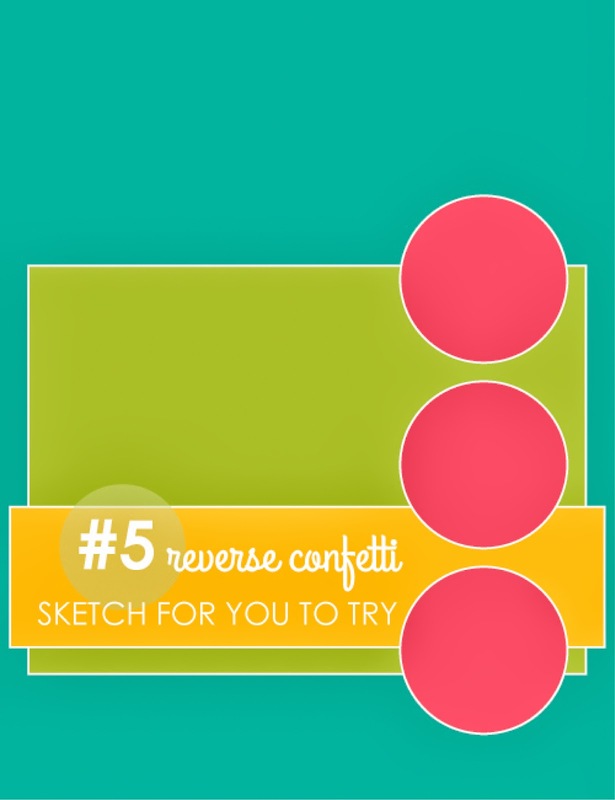 So I paired these fun images up with the layout from Retro Sketches and the ColourQ combo to create my little card. The notebook page was die cut, stamped with the spider web image using Versamark and then the orange bakers twine was added. Over that I layered the panel that I stamped with the witch's shoes (don't you just love those shoes???) in SU! 's Wisteria Wonder and the sentiment in black. A piece of patterned paper from the My Mind's Eye Happy Haunting 6x6 pad was cut, embossed, adhered to the card base and the notebook page & panel adhered. Popping this into the last 'Fetti Find linky list, as well. Hello friends!! Wow... Tuesday has rolled around once, again. Halloween is right around the corner... time sure is flying by! Lots of fabulous pumpkin projects were to be found in last week's gallery and I know that there will be lots more based on this week's cue word of "country". Joining us in the guest designing spot this week is not one, but TWO fabulous designers Hannelie and Lori!! And we have a fabulous sponsor... you can find all the details here. Have to admit I really had to think about this week's cue word, but then all of the sudden an idea hit me. Some of the things that I think of when I think of the country are weather twiggy wreaths and rusty stars hanging on houses and barns. So I pulled out my Memory Box bramble wreath die and combined it with a little "rusty" red star to create my little wreath. I die cut three wreaths from kraft cardstock and then I layered them on some PTI Rustic Cream cardstock. I stamped the sentiment (from the PTI set Fancy Folk Art) inside using Close to My Heart's Barn Red ink. I had this strip of cream muslin that I tied into a bow and adhered to the wreath. I finished off the wreath with a little star (die cut using the PTI Tiny Tags die) that had been stamped with the corresponding star image (PTI Tiny Tags) using Barn Red ink. A little red button was added to the center of the star and I was done. I just love that little muslin bow as it really added a nice homespun slightly shabby feeling to an otherwise very clean design. Thanks for stopping by...I cannot wait to see where this week's "country" cue word take you! In the meantime make sure you check out the cards from the rest of the design team: Melissa, Judy, Meghan, Ardyth, Gillian, Maureen, Kimberly, Jen , Tracey and guest designer, Hannelie. Hello friends!! Have a quick post today with a card that I made for the current Wednesday Stamp Club sketch challenge over at My Favorite things. When I saw the sketch last week I immediately knew I that I wanted to use either my MFT Dispersed Dot Die-namics die or my Fluttering Hearts Die-namics die. Since I hadn't used Fluttering Hearts I decided to go with that one. I positioned it on my card stock and then taped it down with some washi tape (perfect for securing dies to card stock since it is low tack) and then ran it through my Big Shot. Because I was feeling pretty darn lazy last night I used a Studio Calico wood veneer butterfly. I took a little pink button, threaded some twine through the wholes and then secured it to the butterfly so the thread ends would be the antennae. I die cut some patterned paper from the Crate Paper Farmhouse 6x6 pad using a MFT fishtail flag stax die and the stamped it with the "hello" sentiment from the MFT/LJD set "On the Line". I did secure some of the same patterned paper to the card base so it would peek through the hearts, but it is hard to see in the photo. Hello friends!! Hope you had a wonderful week. Fall is in full swing in my corner of the world. For once we aren't having a lot of rain and so instead of soggy leaves on the ground we have nice crisp leaves... so much more fun to walk through!! Have a little clean and simple Halloween card with a somewhat unconventional color scheme to share that I made for several challenges: ColourQ, CAS(E) this Sketch and Waltzingmouse October Pajama Party - Greenish Halloween. I have a collection of older Waltzingmouse stamps that I dearly love but have not used much in the last year for no good reason other than I just have too many stamps! In order to remedy that situation I decided that I needed to start checking out WMS' monthly Pajama Party and see if I could play along. This month the party is all about what else but Halloween and let me tell you if you are into Halloween WMS has some absolutely fabulous Halloween stamps. I have only one WMS Halloween set and that is Cicely at Halloween so I got that out and used the color combo from ColourQ (which just happens to feature the color green... perfect fit for the WMS PJ Party challenge - Greenish Halloween) and the sketch from CTS to help me along. I used some of the small icon images from the set and stamped them using VersaMark ink on green cardstock and then die cut the circle using a Spellbinders plain circle die. 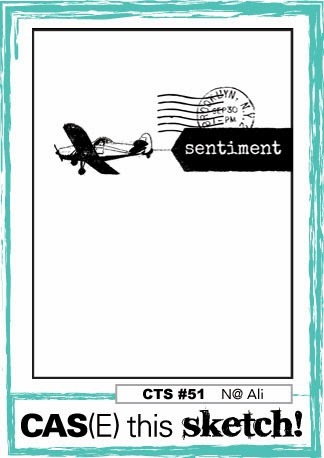 There is a large sentiment stamp in the set and that was stamped on the card base so that it would show through the opening. A fishtail banner was die cut and stamped with another sentiment from the set and adhered. 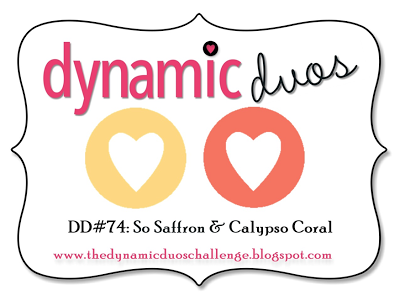 I finished off the card with some My Mind's Eye enamel dates in pink and orange. Hello friends!! Stopping in with a little card that I made using some fun Reverse Confetti stamps and the current color duo from Dynamic Duos. I just love the little woodgrain heart from the RC set Forever Fall. I stamped the heart using SU! 's So Saffron ink and then slightly over-stamped the heart with the sentiment in SU! 's Calypso Coral. I added a little button/bakers twine embellishment to the card, rounded two corners and I was done. Another super clean and simple card, but that is my favorite kind, lol!! Since I used RC stamps on my card I'm also going to pop this into this week's RC 'Fetti Find linky list. Hello friends!! Happy Tuesday! Time for a brand new CASology cue word and our fall/harvest theme continues. So many beautifully "crisp" cards were in last week's gallery! This week we want you to show us what the word "pumpkin" means to you. All the details can be found here. I love pumpkins... seriously... I do! I have a collection of glass pumpkins that I have out year round because they just make me so happy... silly, I know! Anywhoo... despite my love of pumpkins I did want to try to do something other than a card with pumpkins on it, but well... that didn't happen, lol! I pulled out my MFT/LJD Primitive Pumpkins stamps and dies and created the card you see above. To jazz things up a bit I added the little primitive star border that comes in the set and added the little embellishments that you see. I have added a detail shot so that you can see the little sequin leaf (from Lawn Fawn) up close... so cute! There is a new challenge up at Catered Crop...Orange is the New Black, so I thought I would pop this little number into that challenge. Thanks for stopping by...I cannot wait to see where this week's "pumpkin" cue word take you! In the meantime make sure you check out the cards from the rest of the design team: Melissa, Judy, Meghan, Ardyth, Gillian, Maureen, Kimberly, Jen and Tracey. Hello friends!! Have a little card to share that I made for a couple of challenges: ColourQ and CAS(E) this Sketch. The ColourQ combo was a bit of a tricky one for me so I kept the colors to a minimum and also went with more muted versions of the colors. 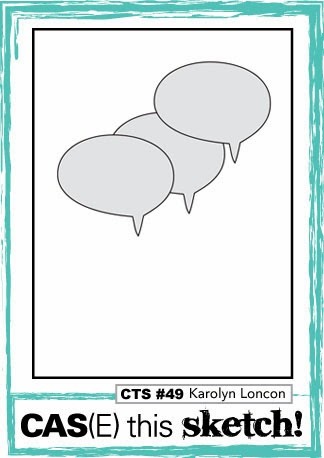 The CTS layout is another fun one and as I pondered the design and flipped through my stamp collection I settled on this cute little balloon image from the Hero Arts set Happy Birthday. I did a bit of paper piecing and used several different patterned papers (from Teresa Collins and My Mind's Eye) for the balloons. The banner was created using a strip of white card stock that had been trimmed from the main panel. The sentiment was stamped and then one end fishtailed. I adhered the banner so that it curves up in the center. There you have it super clean and super simple! Hello friends!! Happy Saturday!! 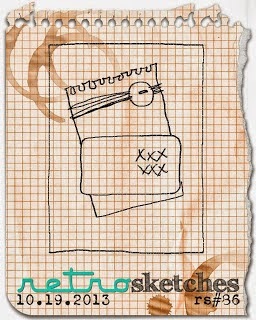 Today is a pretty exciting day for me because I'm the guest designer for Sketchbook Saturday... YAY! Sketchbook Saturday is probably my absolute favorite challenge to play along with and so to be asked to a guest designer... well I just couldn't say no! As you all know the creator of Sketchbook Saturday is the wildly talented Chupa. Not only does she have mad paper crafting skills she also knows how to put together the most creative sketches! Okay... enough gushing, lol!! When I got the sketch I would be working with I immediately thought of another one of my new Penny Black Christmas stamps, merry & bright. I paired that stamp with some My Mind's Eye Lost and Found Christmas papers. I stamped the wreath on cream cardstock using olive green ink, trimmed it out and then added the red rhinestones (I colored clear rhinestones with a dark red Copic marker). A touch of Old Paper distress ink was added to the edges. I cut the kraft cardstock piece, roughed up the edges a bit, stamped the sentiment (from the Penny Black set Christmas Wishes) and then adhered the fishtail flags. After adhering the wreath I realized that the center looked a bit plain so I stamped one of the ornaments from the "merry & bright" set, adhered it and added the twine bow. As a finishing touch I curved up the ends of the fishtail flags. Thanks for stopping by... make sure you check out Sketchbook Saturday. You won't be sorry! Hello friends!! Hope you have had a wonderful week! 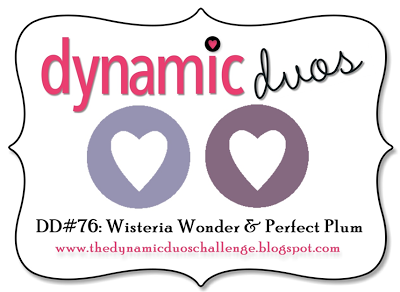 I'm so excited because today the CardMaker blog team is participating in a blog hop with the Webster's Pages design team!1 How fun is that??? We will be showcasing the new Webster's Pages Family Traditions collection. This collection is absolutely YUMM-O!!! If you got here from the blog of Webster's Pages design team member Emeline Seet then you are on the right track. If not, you will want to head over to the CardMaker blog and start there. As I indicated above the Family Traditions line is absolutely gorgeous and I just couldn't make one card... so I made two!! 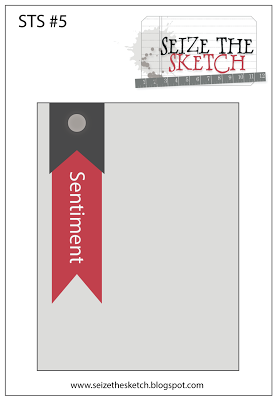 The first card is a fairly simple one based on the sketch from Seize the Sketch. The minute I saw the sheet of red gingham paper that is part of the collection I knew I had to make something with it. I cut a 3 3/4 x 5" piece and matted it with white cardstock. I cut one of the phrase strips from the "Family Time" sheet and then topped it with the yellow polka dotted paper from the "Fall Leaves" sheet that had been die cut with a My Favorite Things Fishtail Flag Stax die. I adhered these pieces to the gingham piece and then added the little resin leaf from the Family Traditions Perfect Accents collection. As a final detail I added one of the little apple clips from the Family Traditions line and then mounted everything on a bright green card base. Squeee!! How cute is that little apple clip??? LOVE!!! My second card uses the gorgeous resin frame and cameo that is also contained in the Family Traditions Perfect Accent pack. I cut a piece of white cardstock and distressed the edges a bit. A piece was trimmed from the Family Time sheet and the edges distressed, as well. A strip of paper was trimmed from the "Thankful" sheet, cut down, one side punched with a spiral binder punch and then the edges distressed. I adhered that strip to the white cardstock piece and then layered the woodgrain piece on top. A fishtail banner was die cut from the "Fall Leaves" sheet, the edges distressed and adhered. 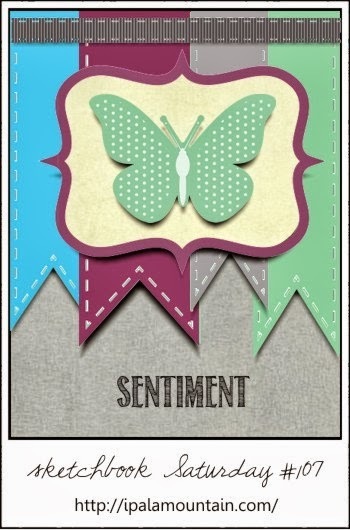 The word "happy" was trimmed from the "Harvest" sheet, the edges distressed and layered on top of the fishtail banner. Finally I adhered the frame and the cameo. My goodness... how gorgeous is that cameo??? LOVE!!! The entire piece was also mounted on a bright green cardstock base. 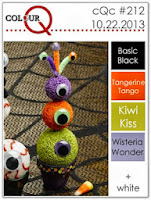 Your next stop on the hop is the blog of Webster's Pages design team member Diana Brodeur. Make sure that you stop at the Webster's Pages blog because it will be worth your while... they are giving away the entire Family Traditions collection!! Supplies: Cardstock: PTI white & simply chartreuse; Papers and accessories: Webster's Pages Family Traditions line; Punches and dies: My Favorite Things and Stampin Up! Hello friends!! Popping in with a little Christmas card that I made with a new Penny Black Christmas and an old Penny Black Christmas stamp. I also wanted to let you know that I have a post up over at the CardMaker blog so I hope you will check it out! My card is pretty simple. I stamped the newly released PB image "flourish holly" using Memento Bamboo Leaves. 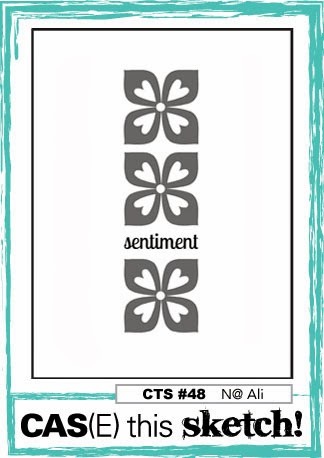 The sentiment (an older PB stamp) was stamped using SU! 's Cherry Cobbler. Once the sentiment was stamped I added little dots of dark red glitter glue and the bakers twine bow. Love how this turned out and because it was so simple to put together I think this may be our Christmas card this year. Hello friends!! Hope your week is going well. Tuesday has rolled around once, again, and that means time for a brand new cue word. Loved viewing all the beautiful "harvest" inspired cards that appeared in the gallery. This week our cue word is "crisp"... hmmm now that is a cue word to really make you think outside the box! 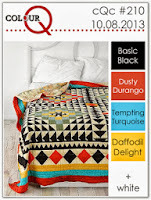 This week we have a sponsor, Uniko Studio and our lovely guest designer is Valerie. All the details can be found here. Now honestly when I saw the cue word only two thing popped in to my little ol' noggin and those two things were leaves and apples... you know kicking your way through crisp fall leaves or eating a nice crisp apple. But I had already done leaves and apples and really wanted to something, anything, different. Thank goodness for a long walk with the dog on Sunday morning to provide me with my idea!! As the dog and I toiled along I thought about other things that are crisp and hit upon a crisp white sheet of paper. Bingo!! Couldn't the card right away as I had several other things to do beforehand (thank goodness we go to church on Saturday night... one less thing! 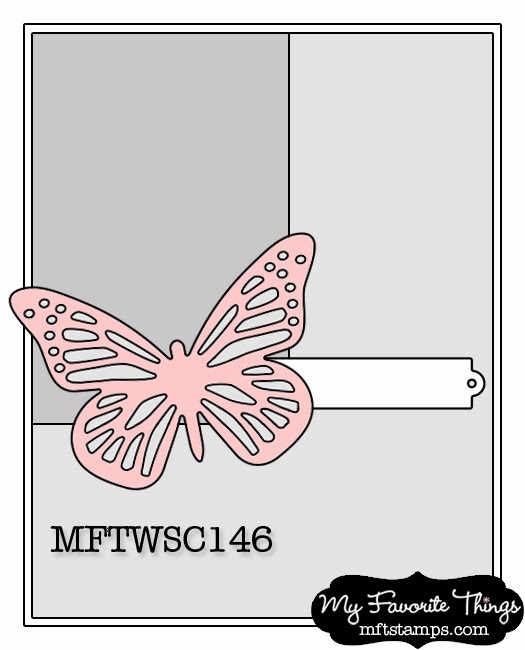 ), but once I got everything done I was able to quickly put together my card. Pretty self-explanatory. Stamps are from the Verve set Take Note. Color combo is courtesy of Dynamic Duos. Die cut the notebook paper using my PTI notebook die. Once all the stamping was done (and the pencil trimmed out) I adhered the note book page using foam dimensionals. Thanks for stopping by... I cannot wait to see where this week's "crisp" cue word take you! In the meantime make sure you check out the cards from the rest of the design team: Melissa, Judy, Meghan, Ardyth, Gillian, Maureen, Kimberly, Jen and Tracey and our guest designer, Valerie! Hello friends!! Here with a little card that was super quick to make and uses the current CTS sketch and the color combo from CAS Colours and Sketches. After seeing a ton of fabulous cards made with the SU! set Mosaic Madness I finally broke down and bought the set along with the matching punch and embossing folder. When I saw the new CTS sketch I knew it would be the perfect set to use. Then I checked out what the new CAS Colours and Sketches challenge was and yay... it was colors this week (pale blue, grey and dark red) so I combined the two challenges. I decided to use only one image from Mosaic Madness to keep my look very tailored and cohesive. I stamped each color, punched them out and then popped them up on the white cardstock using foam dimensionals. The sentiment (from the SU! set Best of Everything) was stamped using black ink. Not a super clever card, but then I'm not a super clever paper crafter... just a simple stamper! Supplies: Cardstock: PTI white; Stamps: SU! Mosaic Madness & Best of Everything; Inks: SU! 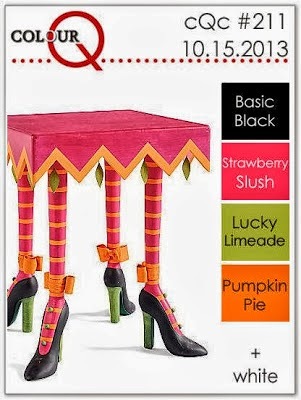 Cherry Cobbler & Soft Sky; Memento London Fog & Tuxedo Black; Punch: SU! Hello friends!! Hope everyone has had a good week... we are finally drying out a bit here in the Pacific NW, but unfortunately the rain is due back on Sunday. Anywhoo... have a little card that I made using this week's ColourQ combo and the October Reverse Confetti Sketch for You to Try. For my card I combined two Reverse Confetti sets, Count Your Rainbows & Forever Fall. I stamped the woodgrain heart image from Forever Fall in yellow, orange and red and then trimmed them out. A strip of white cardstock was stamped with the word "count" in black in and then the phrases "let me" and "the ways" were stamped using red and orange inks, respectively. A piece of SU! 's Cool Caribbean was embossed using a woodgrain embossing folder and adhered to a white cardstock piece. 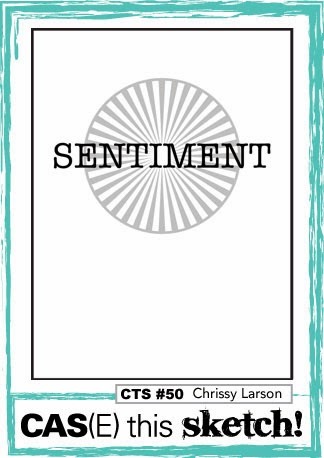 The sentiment strip was added along with the hearts. A few yellow sequins were added and the piece was adhered to a Cool Caribbean card base. Supplies: Cardstock: PTI white; SU! 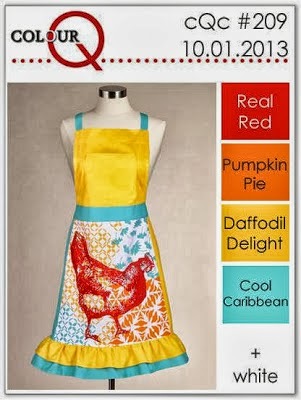 Cool Caribbean; Stamps: Reverse Confetti; Inks: Stampin Up! and Memento; Sequins: Lawn Fawn; Embossing folder: Stampin Up! Hello friends!! Wow... we have sure had some wild and wooly weather in the Western Washington over the last few days. It rains in Washington, but not the way it has been coming down the last few days! Hopefully it will easy off as the week progresses. Anywhoo.... today is Tuesday and that means time for a brand new CASology challenge and continuing along with our fall theme our cue word is "harvest". This week our guest designer is the very, very talented Gay!! You can find all the details for this week's challenge here. This week's cue word gave me a bit of trouble as I don't have a lot of harvest-type stamps and as of Saturday night I still hadn't come up with an idea. After a little bit of a rummage through my stash I finally came up with my very simple design. I used the PTI set Fall Elegance and a small piece of patterned paper from the PTI paper pad "Autumn Abundance". I trimmed down a piece of kraft cardstock to 3 1/2 x 5 1/4 and then adhered a strip of the oak leaf paper from Autumn Abundance" to the kraft piece. I added some stamping along the other side and then added the sentiment. Three Stamping Up! candy dots were added under the sentiment to finish things off. For additional contrast I mounted the piece on a cream card base. Thanks for stopping by...I cannot wait to see what fun "harvest" ideas all you super talented paper crafters come up with for this challenge!! In the meantime make sure you check out the cards from the rest of the design team: Melissa, Judy, Meghan, Ardyth, Gillian, Maureen, Kimberly, Jen and Tracey and our guest designer, Gay!